I am going to be in Central America from December through April, so make your plans to come on down for and Adventure! Email me at info@conservationadventuretours.com to discuss the possibilities of adventuring in Belize's rivers and coral reefs! 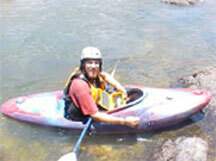 Using Global Positioning Systems (GPS) out of a dry box in my kayak to map impacts along rivers in Guatemala and Belize. If you are interested in these watershed and river maps and how they are made, check out the .pdf versions of the Impact Hotspot Mapping Reports that were generated from this mapping process. The reports contain methodology, raw data and map layouts produces for the project. and includes discussions about teh maps and environmental impacts encountered along the river. 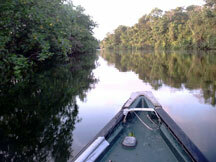 More river mapping on the Temash River in Southern Belize. (note external GPS antenna on the bow of the canoe) This report was conducted through Sarstoon and Temash Institute for Indigenous Management (SATIIM) based out of Punta Gorda in Southern Belize. Geographic Information Systems (GIS) is a computer software platform that provides excellent tools for conservation through the analysis of geographic data. Stay tuned as I build this site and add map portfilios of the past years work as well as links to usefull GIS and GPS sites. Here is a link to my project in Belize!! !